ENGLISH – Viens carburer à l'air salin! NOTE: Our marathon, half-marathon, 10 km, 5 km are certified by Athletics Canada, and our marathon is certified for the Boston Marathon. Runners have the option to run 1, 3, 5, 10, 21 and 42 km. All departures will be behind the Town Hall in Carleton-sur-mer at the Germain Deslauriers Park. 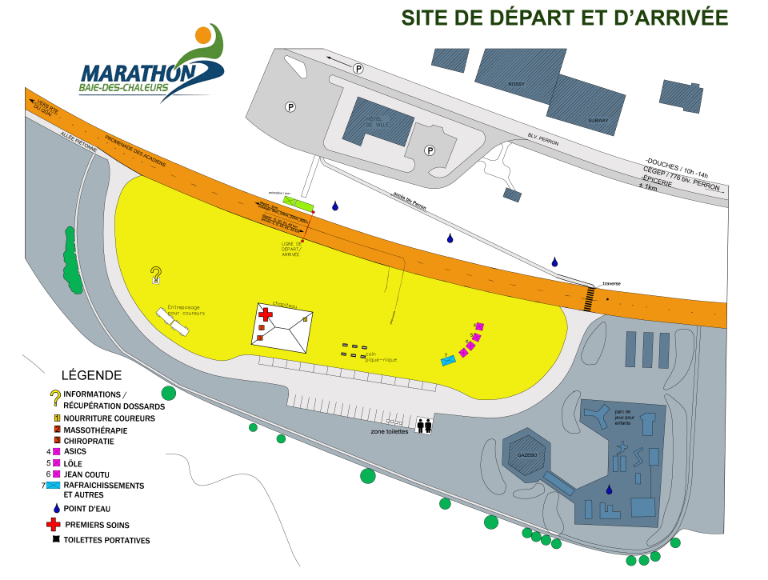 Arrive at least 30 minutes in advance, 45 minutes for the 1 km race. ** It is possible to walk different paths. Numbers will be available at your starting point. For those who choose to do it this way, the distribution will be between 7 am and 9 am. All departures will take place at Germain-Deslauriers Park behind the Town Hall in Carleton-sur-mer, on the Promenade des Acadiens. Allow enough time to go by foot from your parking area to your point of departure. The BDC Marathon is looking for Pace Bunnies to pace the various courses for the races. Each volunteer Rabbit will receive their registration free in addition to a 2018 edition sweater. But what is a Pace Bunny? Wearing costume bunny ears, the person travels the path for a specific time. The goal is to help participants reach their goal for that particular race. At every mile, there is a reference point that helps the Rabbit keep a good pace. A time chart for each distance is also used as a reference. The person must be an experienced runner and be able to estimate their speed. For the lover of running, the experience as a Pace Bunny is rich. It is a form of volunteering and an opportunity to share his or her passion for racing. Before departure, recruits usually go to meet the runners with the pink ears to be comforted and reassured. Following a Pace Bunny in a pack is a source of motivation and encouragement to never give up and to stay focused. Several runners will thank them once they arrive at their destination, satisfaction guaranteed! Here are the times for which the MBDC (BDC Marathon) would like to have Pace Bunnies. First come, first served!